Nine artists have been selected to make new work for the Bideford Black: The Next Generation project ahead of a special exhibition at the Burton Art Gallery in October 2015. Bideford Black is a unique pigment found only in Bideford. This project connects the heritage of the area with the tradition of using it as an artist’s material, commissioning and documenting its use by contemporary artists, developing a greater understanding of this rare material in a contemporary artistic context. On the 11th March, there will be an early opportunity to meet one of the artists at the gallery when Luce Choules will be presenting her recent alpine fieldwork project Guide74 in a special ‘performance lecture’. She will also introduce Seam, the new choreographed exhibition she is creating for Bideford Black: The Next Generation. A Fellow of the Royal Geographical Society, Choules explores physical and emotional geography through experimental fieldwork. Selected by open call last autumn, all of the artists are developing new artworks either with, or about, Bideford Black pigment, for the Burton’s permanent collection. Devon-based artist Tabatha Andrews works in a range of media including drawing and casting forms in paper. Artist duo ATOI, based in Cornwall, are exploring the transformation of material from one form to another. The pair are experimenting with using Bideford Black in false diamonds and even as a surface for martial arts. Inspired by Bideford’s historic industries and their workers, and society’s pre-occupation with the natural, London-based artist Corinne Felgate will set up a temporary cottage industry at a North Devon location. 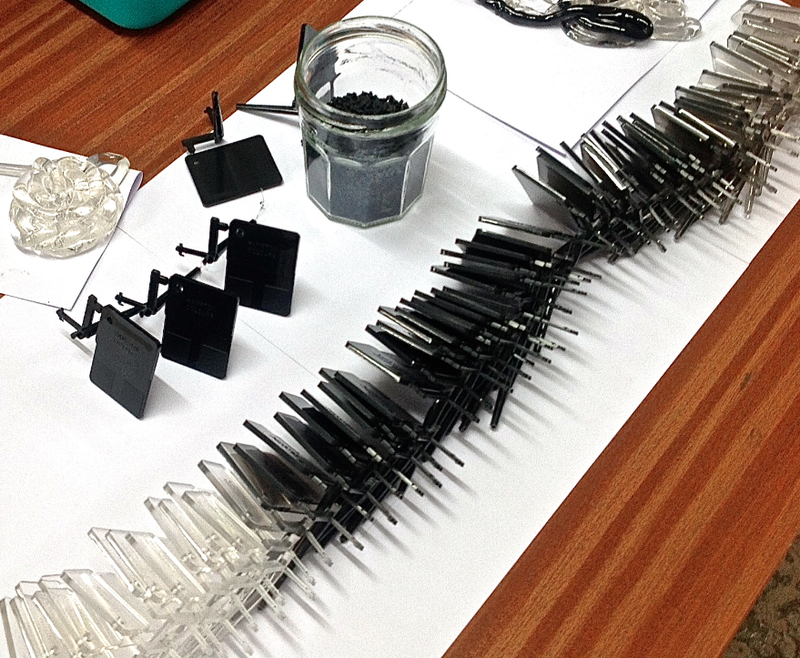 Using only local natural materials, Felgate will create 100 small objects for applying ‘Bideford Black mascara’. Prompted by Bideford Black, and using a shared sketchbook, artists Neville Gabie and Joan Gabie are holding a ‘dialogue of ideas’ with Cultural Geographer Ian Cook (University of Exeter). Together, the artists explore the physicality, social and geological significance of Bideford Black, creating an artist’s film and drawings. Lanarkshire-based artist duo Littlewhitehead are interested in the environmental processes forming Bideford Black: what would the Carboniferous period have sounded like? Their developing commission is tightly under wraps, but may incorporate experimental sound recordings or Bideford Black discs resembling vinyl LP records. Lizzie Ridout will set Bideford Black within a new taxonomy – or story – of the colour black. Incorporating her research into the subject, the Cornwall-based artist will create a printed publication, presented as a sculpture, pieces of which audience members may be able to take away. The final artist, Sam Treadaway is working with Bristol botanists to create a scent inspired by Bideford Black. The scent will be interactively transmitted into the gallery space using a bubble-blowing machine developed by roboticists from the University of the West of England. Film-maker Liberty Smith is documenting the Bideford Black: The New Generation project. As well as filming the eight artists and artist duos as they research and create their work, Liberty will film the landscape around Bideford and the North Devon coast. Smith’s film will be premiered as part of the project exhibition in October 2015. To get an inside glimpse of those involved in the project do join the upcoming talk by Luce Choules on 11th March at 7pm at the Burton Art Gallery. This is a free admission event, but booking is advised - tel 01237 471455 or email burtonartgallery@torridge.gov.uk. Mix up a Saturday, 7 people, a pile of cutting boards, blades and a stack of black paper and you get the most inspired day doing something totally different. I have just returned from a “Paper-Cutting” course at the Burton Art Gallery, Bideford, with the artist Caroline Rees. Textile design student Caroline Rees has evolved her career as a sandblasted glass artist into a paper cut artist over the last few years and was in Devon to share her deceptively simply technique of making papercuts. So after the basic introductions, and the amazement that Caroline had travelled from Swansea to Bideford to run the course for us, we set to work practicing cutting out simple squares on a piece of black paper on the chopping mat, using the blade. In no time, most of the class were ready to move onto working on an image. For some, this was hand drawing an outline and being smart enough to work out how to simplify the image and block it out ready for cutting. For the rest of us we found an appealing stencil in Caroline’s collection, outlined the image on black paper and then, almost in a therapeutic trance, cut around the multitude of lines to reveal a stunning image. For me the appeal of paper cutting is that you don’t need to be an artist, in fact, you don’t even need to be able to draw. The equipment will cost you less than a tenner (cutting board, blade and some paper) and the results are astonishing. All you need is time, actually hours of time, to master the real art of cutting perfect, intricate, tiny shapes. Trust me, I was in awe of the lady working alongside me who was able to cut out weenie circles to make the buds on her flower pattern (SO difficult). Paper cutting – the beginners’ steps. 1) Purchase a cutting board, blade and black paper. 2) Think about what you want to draw. For me it was tough to sit and really think about what image I wanted to create. 3) Create an outline by hand or from a stencil. 4) Break it down into small parts and work out how each part would need to be cut. 5) Then have fun and start cutting out the image from the smallest parts first. Be patient. The draw? The desire to learn something new, something frivolous in Bideford. The attraction? A skill that requires no digitization, just the work of the human hand. 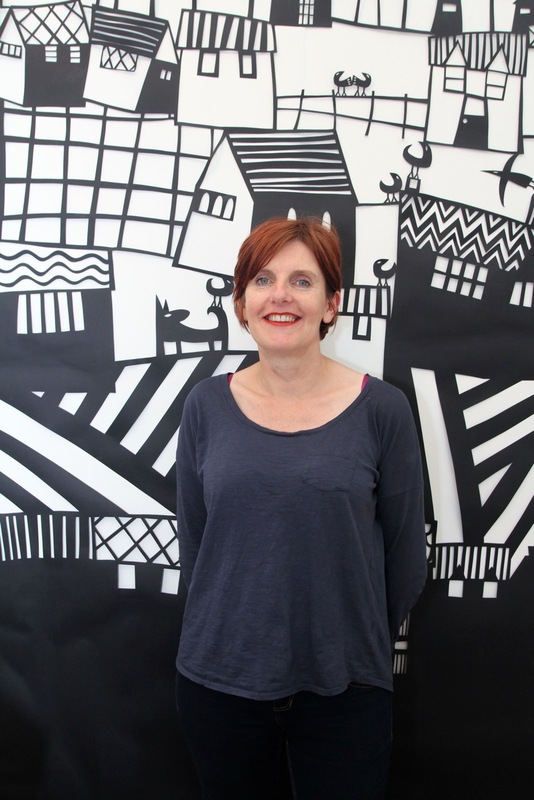 And Caroline Rees – like the art of paper cuts, is enchanting. The result? A huge sense of personal accomplishment as the image emerges from blank piece of paper revealing something I can hang on my kitchen wall with pride! And the relief that I now know what I am going to get everyone for Christmas! So if you fancy having a go at paper cutting, and you missed this course, there is a small selection of paper cutting books on sale at the Burton Art Gallery shop. 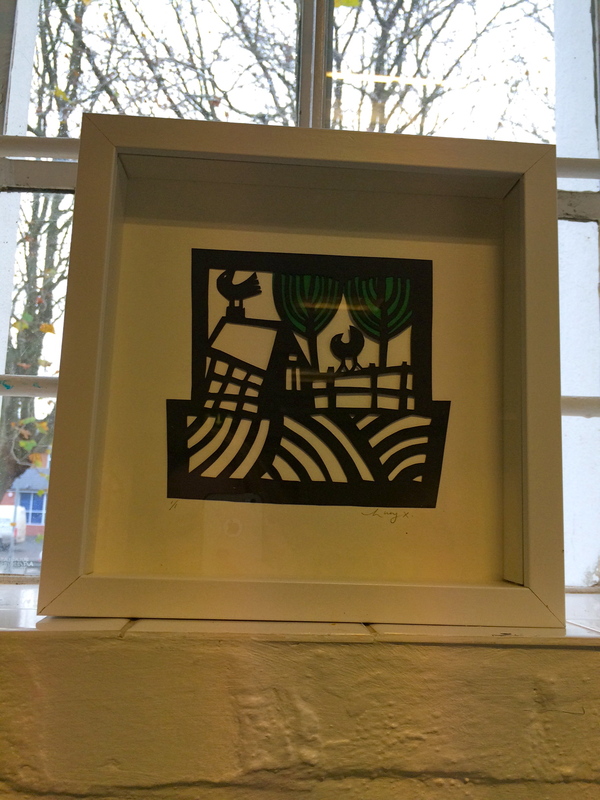 But if paper cutting isn’t for you, then Caroline’s limited edition paper cuts are also on sale at the Burton. The Burton Art Gallery and Museum, is proud to present a public exhibition of works by the celebrated land artist Richard Long, as part of ARTIST ROOMS On Tour. In a career that now spans nearly 50 years, Richard Long, has tested the boundaries of art by creating a substantial and varied collection of work in which he has taken nature as his subject but also as the source of his materials. Credited with being closely associated with the emergence of a new art form, Land Art, Long won the Turner Prize in 1989 and is one of Britain’s most significant artists, living and working in his beloved West Country. Richard Long’s work is deep rooted in his affinity with nature, developed often during walks around the British countryside. Walking repetitively in a line, making a circle of pebbles, arranging sticks in their hundreds, using mud as paint and piling up stones are just some of the many ways in which Richard Long has interacted with the landscape. He was amongst a new generation of British artists who wanted to extend the possibilities of sculpture beyond the confines of traditional artists materials and he began to use natural materials such as clay, pine needles, driftwood, slate, mud and stones in his work. Long is renowned for documenting the experience of his walks with photographs, maps, wall drawings and printed statements, revealing patterns and observations with beauty, creativity and inspiration. As a student in 1967, Long completed ‘A Line Made By Walking’ – a photograph of a field edged by a wood showing a narrow strip of grass, flattened by the action of him repeatedly walking it. Richard Long has stated “I have the most profound feelings when I am walking, or touching natural materials in natural places.” Paradoxically he states that his work is a portrait of himself in the world, his personal journey through it and the materials he finds along the way. ‘A Line Made by Walking’ is alongside other pieces in the exhibition which have a relationship to the South West; ‘Cornish Slate Ellipse’, 2009, and ‘Three Moors’ are included within this exhibition. The works on display at the Burton Art Gallery and Museum are taken from ARTIST ROOMS, an inspirational collection of modern and contemporary art acquired for the nation by Tate and the National Galleries of Scotland through the generosity of Anthony d’Offay with additional support from funders, including the Art Fund. The ARTIST ROOMS tour programme, now in its sixth year, is showing at 18 museums and galleries across the UK in 2014. The tour is made possible thanks to the support of Arts Council England and the Art Fund. Richard Long’s work is a celebration of wild places that often lie hidden, just off the beaten track. He is an artist who has had a lifetime of joyful exploration and simple pleasures, exploring the relation of man and nature, expressing, in new ways, the beauty and fragility of this relationship. 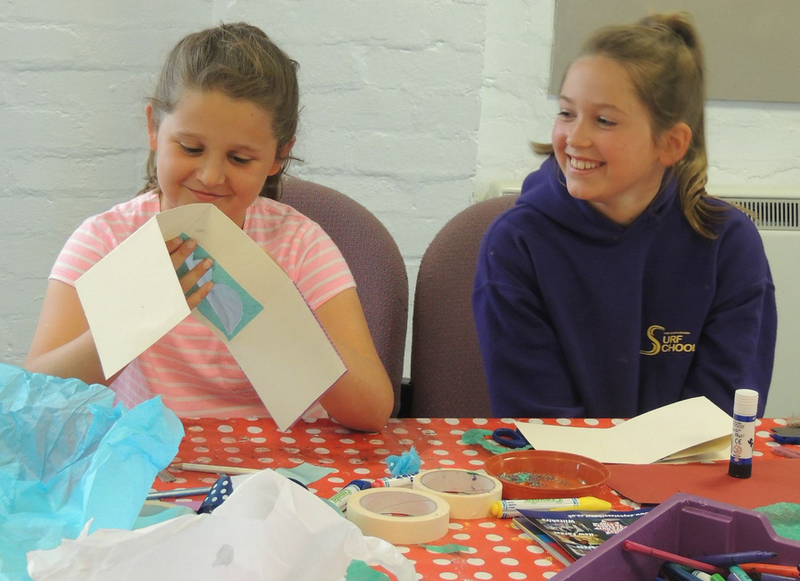 The Burton Art Gallery also hosts regular art activities for children and teenagers, allowing them the opportunity to discover their creative side and get artistically active themselves. Visit www.burtonartgallery.co.uk for further details. Monday – Saturday, 10am – 4pm, Sunday 11am – 4pm. Last week I had the privilege of visiting the Burton Art Gallery to view The Society of Wood Engravers 76th Annual Exhibition. The Society of Wood Engravers was founded in 1920 and is the oldest and most prestigious wood engravers society in the world. The Society had its resurgence in 1980 and since then has toured throughout the UK sharing works from all over the globe, indeed in the current exhibition in Bideford, the UK works on display are alongside those from the US, Japan and beyond. Most wood engravers work in a similar way. Initially the “boxwood” is drenched with paint, once set, the image is painstakingly formed by etching away with millions of score marks using a sharp tool called a “spit sticker,’ until the final design has been created. The raised surface is then coated in a fine layer of ink and once through the press prints directly on paper. Unlike most artists, wood engravers need to remember that the image cut on the block is the reverse of the final print. As such, seeing the final image through the press is a great moment, unlike most forms of art, for wood engravers, this is the first time the intricate finished artwork is seen. In every exhibition I visit at the Burton I try to work out why different pictures appeal, in technical terms, and with regards to wood engraved work, the complexity and range of techniques employed by the artist’s marking with the “spit sticker,” and the content and message the artist is intending to convey. Hilary Paynter attracted my attention at this exhibition; I guess part of the connection was knowing a little about her work and her intention to make a statement and indeed in many of her pieces, social commentary. Also as an artist living and working from her home base in Bideford, I feel I can relate to her. I was also interested in how many of the works depict very physically dramatic locations and for the artist to record them would have meant many hours perched on the edge of a hill, on the side of a river, or cliff whilst the changing seasons, weather and light become a part of the final appearance of the work. Much of the work on display features intricate designs with beautifully thought through compositions and the range of “marks” is truly extraordinary. The exhibition, featuring over 140 engravings from Britain and around the world, recognised as the showcase for the engraver’s art, is well worth a visit, and is on at the Burton Art Gallery until 15th September. The Society of Wood Engravers 76th Annual Exhibition at The Burton Art Gallery until 15th September – FREE ADMISSION. Opening Hours: Monday – Saturday, 10am – 4pm. Sunday 11am – 4pm. Six weeks is a long time to keep anyone entertained, let alone your toughest critics. Don’t panic, though, for those of you in North Devon, the Burton Art Gallery and Museum has got this year’s school summer holidays (24th July – 3rd September) sorted. Bideford’s Burton Art Gallery has just announced their “Summer School,” a huge variety of art workshops, all led by local artists, taking place across the holidays. The eclectic range of creative activities for young people aged 3 to 11 year olds, and families, in its fully equipped contemporary workshop studio include drop-ins, art workshops and craft courses. Families are also encouraged to explore the gallery and museum using the free and self-guided Burton Family Trail (all ages). Tuesday 29th July 10am – 4pm £15 Re-create everyday objects from umbrellas to tennis rackets, using a wire frame and tissue paper. Tour the museum and choose your favourite artefact to produce ghostly replicas. Tuesday 5th August 10am – 4pm £15 Create simple moving models using levers and handles from painted & decorated card and recycled materials – mad, crazy characters of your choosing! Wednesday 13th August 10am – 4pm £15 One person’s trash is another’s treasure, and this couldn’t be more true with all of the emerging artists tapping into the creation of upcycled accessories. Make your own original necklaces, bracelets, bags or brooches from throw-aways! Friday 22nd August 10am – 4pm, £15 Create a ship or seaside scene in a bottle, taking inspiration from Bideford’s rich maritime history. Fat & Flat Fish Wednesday 27th August 10am – 4pm £15. Make colourful 3D paper fish; from sardines to sharks or even a whole shoal, hang your creation from a fishing wire to proudly display at home. Friday 29th August 10am – 4pm £15 Create a fun windsock animal, fish or insect that will catch the wind & can fly all the way home with you! 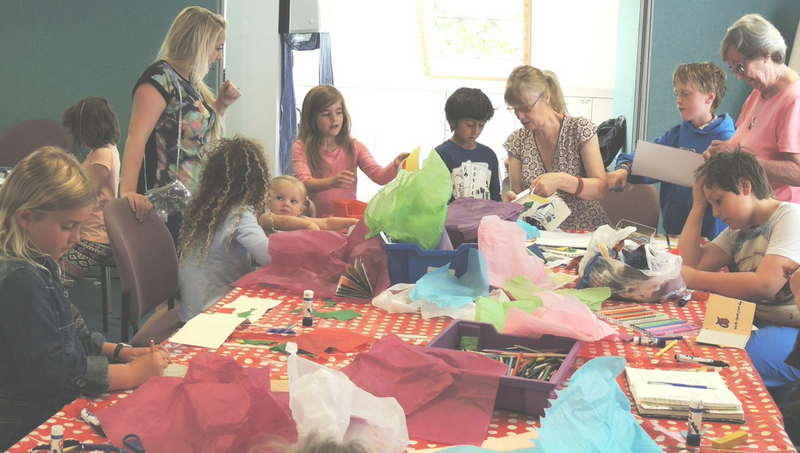 Every Monday throughout the summer (except August Bank Holiday) from 10am – 12noon there are simple, fun and effective activities in the Crafty Kids class for under 5’s and their families. Out and about in the galleries every day of the school holidays, the Art Trolley is the perfect way to get creative at the Burton. Free activity for you to enjoy. 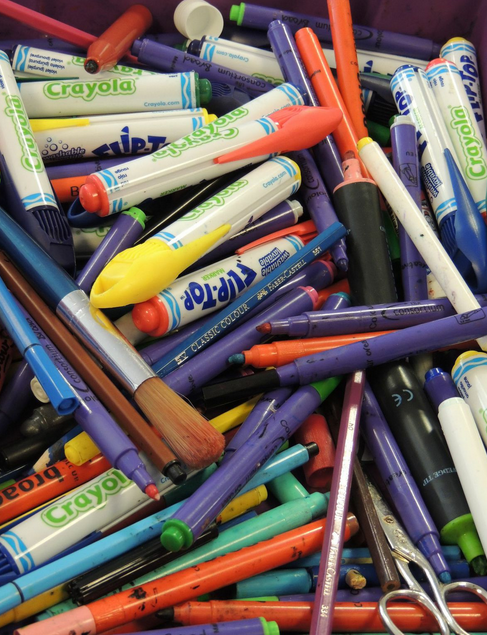 On the last Saturday of every month, local artists run themed arts and crafts workshops. £1 donation per child. So if the rain is beating against the window and you’ve got cooped-up, bored children on your hands, or if the sunshine has stayed and you need to do something other than a “beach-day,” then booking in a workshop at the Burton might be just the ticket!